South Carolina Churchgoer gouges out own eyes: Parishioners are left in shock as a 19 year old teen girl self mutilates herself. 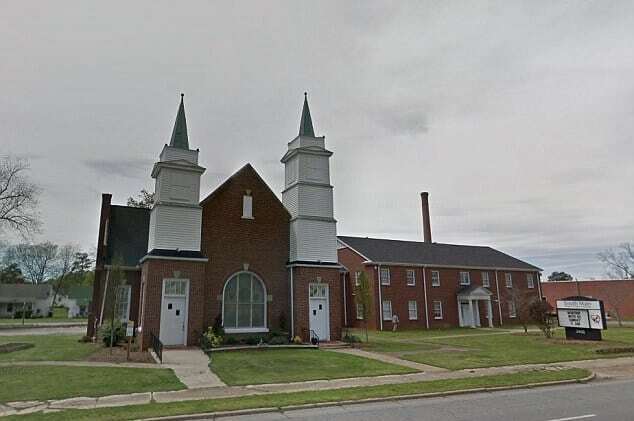 A churchgoer at an Anderson County, South Carolina church has caused disconcert after gouging out her own eyes. The unfolding scene which happened Tuesday morning in front of shocked parishioners on church grounds led to frantic screaming and yelling. WYFF News4 reported witness, Elizabeth Hiott saying she was working at the South Main Chapel and Mercy Center when she heard screams coming from outside and someone yelling for her to call 911. ‘It was across the street, and I could see blood, and could hear her screaming, and I realized something was wrong. Something was terribly wrong,’ Hiott said. The ‘her’ Hiott was talking about was a 19-year-old woman that sometimes attended the church but was not considered a regular member. At the time the woman had been walking outside on church grounds when she proceeded to self mutilate herself with her bare hands, before proceeding to kneel close to railway tracks, perhaps in self disbelief as to what she had just done. As parishioners looked on dumbfounded, with blood pouring onto the ground, the teen who by now was holding one of her eyeballs she had pulled out of its socket, proceeded to also pull out her other eye. South Carolina Churchgoer gouges out own eyes: She fought off anyone who tried to help her. Responding paramedics would be greeted by the macabre sight of the 19 year old teen holding both her eyes in her hands, all the while vehemently resisting any overtures for assistance. Anderson County Sheriff Chad McBride, told of the distressed teen fighting anyone who came near her. It took several deputies and two emergency medical workers to subdue her. The woman was eventually secured to a stretcher and airlifted to the hospital. Her current condition is unknown. South Carolina Churchgoer gouges out own eyes: How did she end up at the church? Investigators are now trying to piece what led to the woman self hurting herself and whether she may have been on drugs at the time. How or why the incident came to happen on church grounds remained unclear or whether the woman had moments earlier had been inside the church for any services that may have been happening. Or perhaps had sought the assistance of the church? Reflected Hiott further, ‘Prayer and community and family is what’s going to get us through this’. Except when it doesn’t….